With some of the race lengths still to be finalized – Road America will be “longer than two and three quarter hours” (and will run into the twilight) while Long Beach, on Super Saturday, will be “90 or 100 minutes”, for example – this is the 2007 ALMS, 12 race schedule (up from ten). October 20, Mazda Raceway Laguna Seca, SPEED. 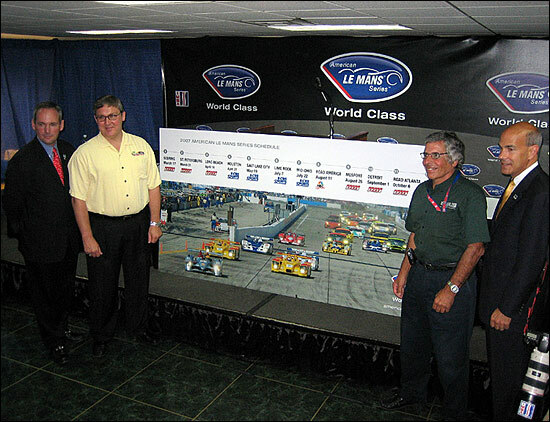 Tim Mayer and Kevin Savoree (MD of the St. Petersburg event), and Jim Michaelian (Long Beach) and Scott Atherton are seen on either side of the 2007 schedule board. So Portland is no more, and there are three new events – St. Petersburg (with the IRL) and Long Beach (Champ Car) before the Le Mans break, and a third street race, at Detroit (with IRL), early in September. Petit Le Mans is a week later, to “better co-ordinate with other Le Mans style racing,” according to Tim Mayer, while Salt Lake City is earlier in the season, to avoid the worst of the desert heat. That makes a record five races before Le Mans, with a run of seven to the end of the season. “One of the hallmarks of a successful, viable organization is continued growth and reach and after saying last year that the 2006 schedule was the strongest in our history, we have raised the bar in a big way for the premium brand of motorsport in North America,” said Scott Atherton. “Everybody wins with this schedule." There were other notable features of the annual state of the series address – 24 hours before the 75th ALMS race. One centred around performance balancing, and resulted in an unfortunate turn of phrase from Audi’s Herr Ullrich. “It’s a challenge to balance the rules that are optimized for Le Mans,” began Scott Atherton, in this phase of the presentation. He admitted that the “execution of the plan has not been perfect,” but changes are planned. “Recently we spent two days with the ACO at Le Mans, and they now recognize that a series needs options for adjustment,” stated Atherton. To ensure that top independent teams can compete with factory teams, there will be two adjustment periods each season (assumed to be at the one-third and two-thirds points) at which weight, fuel capacity, boost and restrictor sizes can be adjusted. These revisions will apply to the Le Mans Series too. Arguably they haven’t been needed in the same way as they have in the ALMS, but there will be provision for them for 2007: the assumed arrival of Audi with the announced arrival of Peugeot, in Europe, are logically the driving forces here. And at this point, Herr Ullrich asked a question, which Scott Atherton responded to very concisely and thoroughly. There had already been references to the difference between a set of regulations applying to one, 24 hour race, and those that are needed on a variety of circuits in a now 12-race series. Rob Dyson responded with his own views – in a very clearly explained address. “I applaud the fact that the ACO has recognized the distinction between a single event and a series. In the past, before Don Panoz created the American Le Mans Series, there was only Le Mans – and manufacturers could turn up with a mobile laboratory. But to preserve the viability of this series, the promoters need cars that can run close together on performance. My hat’s off to the ACO, the ALMS and IMSA. So those were the most significant events this morning, although there was confirmation that the series is looking to a single fuel supplier for 2007, and that could be Shell – but if it isn’t, “maybe the next challenge for Audi will be to do it with another fuel supplier,” suggested Tim Mayer. IMSA will be looking at the energy level of the three different fuels likely to be required - petrol (gas), diesel and ethanol mix - “to ensure the relative competitiveness of different fuels.” IMSA’s boffins apparently have sufficient of the Shell diesel to answer their questions on that score. It was a fascinating ‘state of the series’. Qualifying starts shortly though!